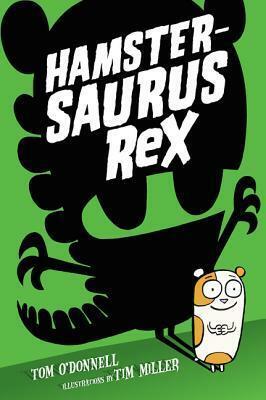 When a mysterious growling hamster appears at the back of his class, Sam knows just what to call him: Hamstersaurus Rex. Sam tries to protect Hammie from an overzealous Hamster Monitor, and from the meanest bully in the history of Horace Hotwater Middle School. The bully isn’t afraid of some weird little class pet. But maybe he should be. Hamstersaurus Rex is no ordinary hamster. Tom O'Donnell has written has written for The New Yorker, McSweeney's, and thetelevision shows Jeff & Some Aliens, TripTank and Billy On The Street. He lives with his wife and son in Brooklyn, New York. Check out his website tomisokay.com for semi-up-to-date news! Tim Miller grew up on a dairy farm in Snohomish, Washington, with lots of cows and ducks, who inspired him to write his book Moo Moo in a Tutu (although none of them ever wore a tutu). After milking one too many cows, Tim mooved east to study at the School of Visual Arts, where he earned his bachelor's in cartooning and his master's in art education. Moo Moo in a Tutu is Tim's picture book debut as an author-illustrator. He lives in New York City, and you can visit him online at timmillerillustration.com. This book was adorable and we had a very fun time reading it together. This is such a great book! Although this book is noted for kids in the middle grade age group. It was also great for Awesome Annie who just started school. Many of the words used in this book are part of her sight words she needs to learn. And this way she was able to learn them in a fun way! The story in this book was cute and inventive. It will get kids to use their imagination and have a fun time reading! We would recommend this to those who love animals and are looking for a slightly creepy story this Halloween.